A knife sharpening stone, also known as a whetstone or a Japanese waterstone, is a block of stone designed to hone and sharpen the blades of knives. The name whetstone comes from the verb “whet” which means to sharpen. Due to their design – they are normally flat with no constrictive edges – they are also used for sharpening most items that have an edge, such as scissors, razors and tools including chisels and planes. They are not particularly exciting to look at but they get the job done. As you can see from the picture above they generally come with two different grades, one on each side. There will be a coarser side that will treat the blade a little more roughly than the finer side which will treat your knife with a little more care and love. You will use the side you need to use depending on your knife and how much tender loving care it requires. Whichever stone you decide on, it will come with instructions for their proper use because they do vary a little between makes and models. Some sharpening stones require soaking in water before use for around 10 minutes. Some just require to be made wet, and some can be oiled. Note – if you oil a whetstone you cannot use it with water from then on. You always start with the coarser side of the stone and end up with the finest side. The action is the same on every stone. You place the heel of the knife on the stone and raise it to the required angle. Then gently sweep the knife in an arc across the stone and towards you. You repeat this action for each side of the knife. The important thing to remember when you first start to use a sharpening stone is to relax! Take your time and pay attention to what you are doing. As mentioned before, if you are not that confident or just want to practice to begin with, then don’t use your expensive knives. Get the technique right on a cheaper knife, just in case. With regards to how much pressure to apply – just use the weight of the knife to apply the pressure on the stone, you don’t need to press down anymore than that. Make sure you sharpen both sides of the knife equally. Follow the manufacturer’s guidelines with regards to keeping the stone moist throughout the sharpening process. 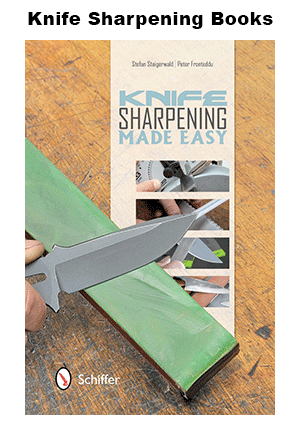 You’ll soon be sharpening your knives like a pro in no time. It’s easy to look after sharpening stones – simply rinse them in clean water after each use. It isn’t known exactly when sharpening stones or whetstones originated but it’s many years ago that is for sure. 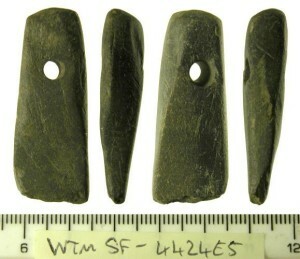 This is an ancient whetstone believe to date from 720-1000AD! It was discovered in 2011, in the United Kingdom in a county called Suffolk. The sharpening stones you can buy now haven’t evolved a lot from the one found above. The main difference is that they come with two grades on each side (apart from the new tri-stone from Wusthof that has three, see below). The grade of the grit is referred to by a number. You might assume otherwise but actually, the smaller the number equals the coarser the grit. Therefore, if you are new to sharpening stones and not confident with their use, then err on the side of caution and opt for a finer grit (larger number) as you will be less likely to damage your knife while you are perfecting your sharpening skills. If you look into grit ratings you might come across different letters. Don’t be confused – the numbers just refer to the fact that there are two accepted standards for grit ratings. There is the Japanese standard (J) and then the European FEPA (F) standard.